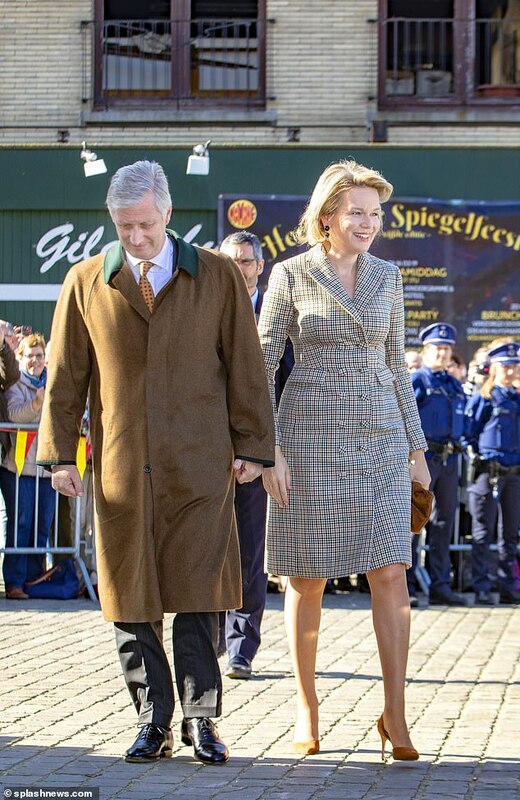 Queen Mathilde of Belgium looked elegant in a tweed ensemble today as she joined her husband King Philippe, 58, for a visit to Antwerp. 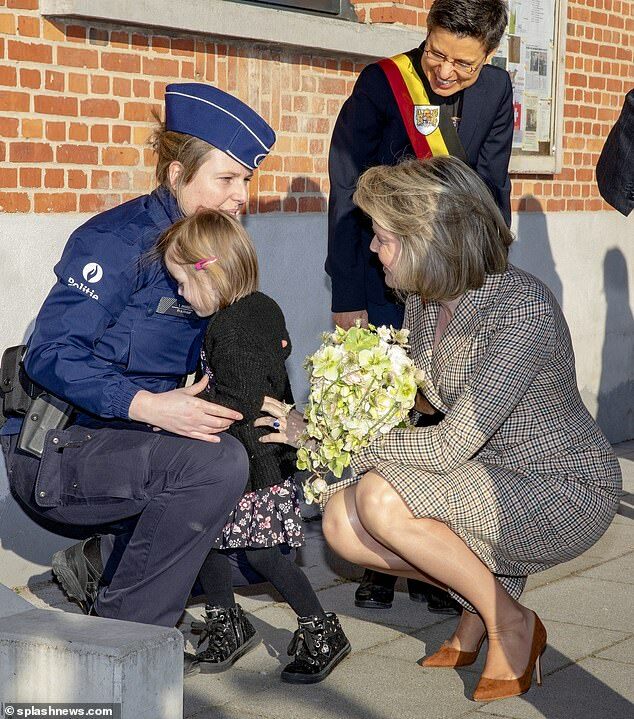 The royal couple were meeting members of the public during their visit to the city of Herentals. Evidently enjoying the sunshine, Queen Mathilde, 46, showed off her sartorial prowess in a knee-length tweed coat dress. The stylish beige ensemble is taken from Belgian designer Natan’s FW17 couture collection and was teamed with a pair of brown suede kitten heels and a matching clutch bag. Adding more class to the look was a pair of brown and green drop earrings, which were tucked under her well-coiffed blonde bob. The mother-of-four was all smiles as she greeted well-wishers who came out to see the monarch and his wife. Creating in a sea of Belgian flags, hundreds of children waved at the couple who received gifts and shook hands with fans. Sporting a classic make-up look and peach lips, the Queen wore her hair in a side-parting sporting a sophisticated look. 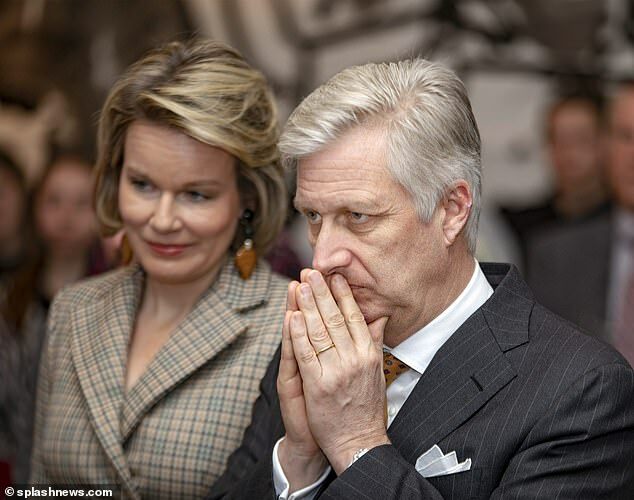 Colour coordinating with his wife, King Philippe wore a dark brown overcoat with stand-out green trimmings. Under the coat, Philippe added a pop of colour to his suit in a bright orange tie with polka dots. Holding hands as they spoke to supporters, the married couple looked as loved up as ever as they met the public. At one point, the Queen, who had been handed a stunning bouquet of flowers, crouched down to speak to a young girl, who appeared shy as she turned away to hug a police officer. Later the ruling family looked animated as they spoke to artists. This royal engagement marks the start of busy few months for Mathilde, who will attend the opening session of the World Resources Forum in Antwerp this week. The event will see international experts from the circular economy, scientific world, private sector and civil society all come together. Mathilde will be in attendance as she is an advocate of The Sustainable Development Goals of the United Nations, which aims to promote sustainable production and consumption patterns through the efficient use of raw materials and energy. She will also be a prominent speaker at the ‘rebalancing power in global mental health’ symposium on Friday 22nd March. There, she will hope to achieve more equal knowledge exchange between countries in Global Mental Health.